Come and enjoy our pristine home on beautiful Calef Island. Drive across a birch lined causeway and you will find this spacious year round Half Acre Lake House in Barrington, NH. Walk through the front door and be greeted with sun filled rooms, cathedral ceilings, and spectacular lake views. A nature lovers delight this 3 Bedroom/2.5 Bath is situated on a gorgeous property complete with 180 feet of water frontage. Two sandy beaches, hammocks, outdoor grilling area, kayaks with life preservers, water toys are all yours for the taking. Read underneath a canopy of trees, swim off the dock into cool clear waters, or kayak this 3.5 mile lake. Then dine on the deck or patio area, listen to the sound of loons, and watch one of the best sunsets you have ever seen. And for all the fisherman out there Swains Lake has been written up as New Hampshire's 'Hidden Treasure'. We often have been told 'One week is not enough! Visit the historic seaside town of Portsmouth NH -17 miles away- with its endless choices of fine dining, museums, cruises, and shopping. My husband and I have lived in New England our entire lives. We enjoy the beautiful four seasons and especially love the outdoors. Hiking, swimming, skiing, kayaking, or just enjoying the wildlife are only some of our passions. Trying to balance a busy work week with time for the outdoors had been a real challenge, until we bought the house on Calef Island. My husband has renovated the property, starting with the downstair bedrooms, adding a full bath, and updating the family room. He has just completed replacing the two bathrooms upstairs, windows and all. He is a true genius, already is planning projects for 2019. I, on the other hand, try not to irritate him with last minute changes and tweaks that inevitably drive him nuts......wall colors are the hardest, he thinks I should seek counseling. Growing up in the Berkshires, in western Massachusetts, I have always loved the endless hills, valleys and lakes. 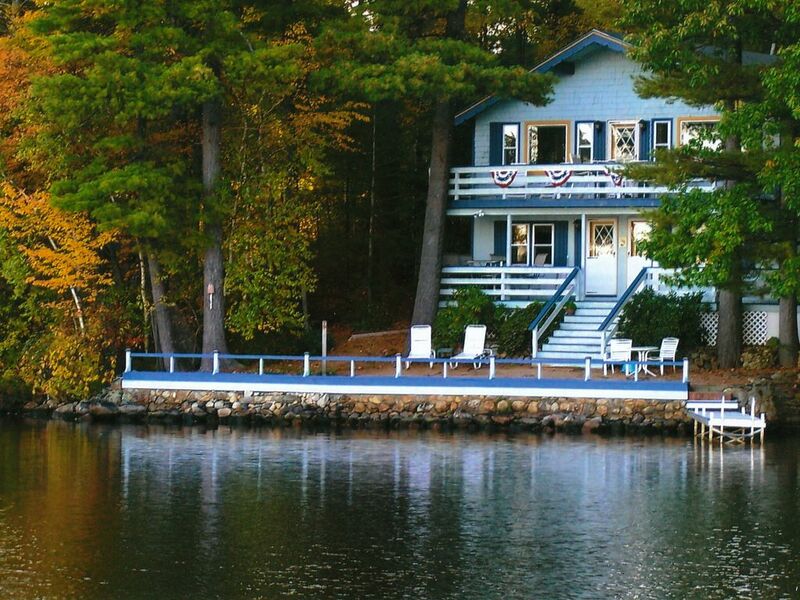 One of my fondest memories was spending my summers at my grandfathers cottage on Pontoosuc Lake in Lanesborough, MA. When I married and moved to the Boston area my husband and I wanted a property closer to us. Friends knew of this and asked us to see their house. It truly was love at first sight, as we walked in the back door (front door is on the water) we could see straight to the lake, with the sparkling waters and sounds of Loons. The windows were open and a soft breeze filled the house. The water was only 20ft from the house. Sunny with open views of conservation area, wildlife, and blue skies, and the soft waves were mesmerizing. We knew there would not be another property to better this one and we have never regretted it! The wonderful feature of this home is that you drive directly to the back door, unload, and walk out the front door to sun and fun. It is clean, private, quiet, and peaceful. That is why most of our weeks are rented to repeat guests that have been with us over 6 years, taking two weeks for their total enjoyment. The property has 1/3 of an acre for outdoor living space, families have ample space to play or relax, swim or sleep in one of two hammocks, lounge chairs, or dining table. See our reviews!! The upper deck is one of the most beautiful sitting areas on the property. With a southern exposure overlooking 100’s of acres of conservation land it is a nature lovers delight! 2 grills; one on the upper balcony, another larger one in the patio area, outdoor refrig/cabinet for easy outdoor living, barbecue utensils, cling wrap/aluminum foil/sandwich bags, spices, condiments, ironing board and iron, 3 TV's with DVD's LR/MBR/family room, office area with high speed Internet with printer, coffee maker, blender, mixer, glassware with new dinnerware, complete baking and cooking utensils and pans/pots (lobster), comfortable outdoor furniture and floating lounge chairs, outdoor camp fire. One set of linens provided for each bed, we are responsible for garbage removal. **Children limited to 10 years and older **Pet * Well-mannered dog, proof of rabies/heartworm/kennel cough must be provided from your vet prior to arrival, fleas/tick prevention. This protects your pet as well as others, no exceptions. Our family spent a week this summer at Calef Island and it was truly an amazing experience. The home and property are well kept and are stocked with all the things you could possibly need. We spent most of the time grilling, swimming and just relaxing. The view is amazing, and the lake was perfect. The kids had a blast swimming and playing all day. The a/c was a nice treat especially with hot and humid weather we've been experiencing. I would highly recommend a stay here, and look forward to going back again! Our family of two seniors (mom and dad), five adult children (youngest 29, oldest in her 40's) and one very energetic Australian shepherd recently spent the 4th of July week at this lovely lakehouse. The young adult "kids" came and left on different days, as their busy professional lives allowed, with only a couple days of overlap when we were all there. Everyone found the house and location delightful. We all swam and kayak'd and the young men in the family all fished, with some degree of delicious success. The hammocks were also very big hits. The world cup was happening, so there was also a lot of soccer watching. The kitchen was wonderfully complete and we ate out only one time the whole week. We barbecued almost every night, and even made s'mores in the fire pit one night. Our California born and raised "kids" especially enjoyed setting off fireworks over the lake, something strictly forbidden at home. Most nights, the sunsets were lovely and sitting on the porch overlooking the lake with a cool glass of something was much enjoyed. The loons in the early morning were a joy to see and hear. We would all heartily recommend this lovely home to anyone looking for a beautiful place to unwind and savor some quality family/friends time. It was so nice to meet you and your family, glad you loved the place as we do. Look forward to your return next year! This wonderful home is truly a Gem on the lake. We have stayed here several years and will be back next year. We love the beautiful views across the lake (enjoying the most amazing sunsets! ), the family- and dog-friendly beaches on the property, swimming and kayaking in the clean lake, listening to the loons, cooking family dinners in the well stocked kitchen, and the quiet atmosphere that Calef Island offers. The house is perfect for a couple but can also accommodate families easily. We love it here! Thank you again for sharing your experience at Calef Island. It is wonderful that you have come back twice in one summer! I am so glad you were able to take 2 weeks in June and 2 more in August. Both times are so relaxing. I wanted to take this opportunity to let potential guests know, the best way to contact me is at 508-265-5487 or mamarshall1@verizon.net. I have found in the past that I can more easily answer any and all questions with direct contact. We have been coming here for about five years so needless to say we enjoy the house, the lake (can’t beat the view) and especially the owners very much. Mary Ann and Ken are delightful, responsive people who really are very accommodating and make sure you enjoy your stay. The house is very private with a large piece of land and a spectacular view. The fishing is quite good, kayaking is great fun and reading a book on either porch is a great way to end the day. There are not a lot of restaurants nearby but if you grill something up, you can kick back and relax at any of three outside areas and you are guaranteed the best waterfront dining to be had. Can’t beat that!! We love coming up here every year to Maryann & Ken's cabin because it's like coming home. Everything you need is close and at the same time you feel like you're away from it all. Best view on lake bar none. Best fireworks display I've seen it many years plus the 4th of July boat parade was amazing. Thanks again for letting use your wonderful cabin. Thank you for the great review. We are always amazed at the display on the lake for the Fourth of July, the boats and fireworks are incredible all week long. Every summer you and your family take 2 weeks, 2017 makes 8 years straight! We are so lucky to have you. 2016 was our 3rd year returning to this beautiful place. The lake, kayaking and swimming are just wonderful. Sitting on the deck every day having breakfast over-looking the lake, is one of our favorite things to do. Our labrador thinks this place is the best. He can’t wait to get into the water. They graciously let us bring our newly rescued 13 year old labrador. We did not know how she would do, but she loved being there and she loves to swim. That was great for exercise for her old joints. There is a beach which makes it so easy to get into the water. No climbing over rocks! Then there is the dock, the hammock and games to play. MaryAnn and Ken could not be more welcoming. The home is just perfect. The Calef Country store is not to be missed they have the best sandwiches! We came home with hundreds of memories preserved in our camera and can’t wait until next year! Thank you so much for choosing our home. We love to share the space with your beautiful rescue dogs. They are such a delight to be around, always so happy. I have learned so much from you and Phil regarding Lab Rescue LRCP, a non-profit volunteer organization that is committed to rescuing, vetting, and finding loving homes for these wonderful animals. Will be seeing you and the doggies, again, this summer for 2 more fun filled weeks!! Calef Island in Barrington, NH Is just 15 miles west of interstate 95. This region offers everyone of all ages a diverse choice in recreational activities. Golf in the early morning, shop the outlets in Kittery, Maine, pack a picnic for the Hampton beaches, take a cruise along the seacoast in Portsmouth and fish or dine your time away. Hike the White Mountains, or ski the wintery slopes. ***Consideration made for other time periods, either shorter stays minimum 3 nights or monthly off season rental Please call Mary Ann at 508-265-5487 or mamarshall1@verizon.net **KAYAKS (3 single, 1 tandem) -- $125/wk Additional boats can be rented/delivered thru Everett's Cove Marina in Maine Note: Until confirmed, rates are subject to change without notice.